EU agrees Brexit deal, but will MPs? The last month has seen Sterling fall off a cliff against the New Zealand Dollar. It was just on 11th October that GBP hit 2.044 in typical mid-market rates. Now, it has plummeted to 1.857, due to fears that British MPs will reject the Brexit deal and a warning from the Governor of the Bank of England that in the event of a ‘no-deal’ Brexit at the end of February 2019, that the Pound could slump 25%. In contrast, the New Zealand Dollar strengthened on hopes that the G20 meeting at the end of November would bring together US President Donald Trump and China’s President Xi Jinping for trade talks. The monthly high came on 4th November of 1.965 and the low was on at 1.857 on 30th November. There were hopes going into the G20 trade summit in Argentina at the end of November that President Trump might use the occasion to “show sincerity and meet China half way”, as China Foreign Ministry spokesperson Geng Shuang put it. President Trump cast a shadow over that by admitting the two sides are closing in on an agreement, but adding he is not sure he wants one. "I like the deal we have now,” he says. China is New Zealand's largest trading partner, with two-way trade valued at over NZ$27 billion in 2018, so any change in the relationship affects the New Zealand Dollar. So far, the US has imposed trade duties on $250 billion of Chinese goods in retaliation for “unfair trade practices. China has itself added import duties on US products worth $110 billion. If no thaw happens, then it is feared that come the New Year, the United States may hike tariff rates on $200 billion of Chinese goods, which could prompt a further escalation. That would put more pressure on the NZD against major currencies, including the Pound. The currency markets like financial stability, so it was little surprise that NZD rose towards the end of November following good news in the latest Financial Stability report from the Reserve Bank of New Zealand (RBNZ). Although financial systems risks remain high, they have eased, thanks to a slowdown in property price rises and mortgage lending growth, the bank says. “New Zealand is exposed to global risks through both trade and our banking system’s need for foreign funding. However, banks have reduced their reliance on foreign funding over the past decade, improving their resilience to global risks. “Household lending growth has slowed, and fewer mortgages are being provided at high multiples of income or on interest-only terms. This is helping to gradually improve the financial resilience of the household sector. “House price growth has also slowed, particularly in Auckland. We think house price growth will remain low for some time, particularly as some Government initiatives are likely to weaken demand and support supply. The longer that house prices grow slowly, the less likely it is that they will fall sharply in the future.” As a result, it eased mortgage lending restrictions and monitor banks’ behaviour. Banks can now make up a fifth new mortgage lending to borrowers putting down less than a 20% as a deposit. Previously the limit was 15%. The minimum deposit for property loans has also been relaxed, from 35% to 30% of a home’s value. The RBNZ is still concerned that high debt and asset prices mean the global economy remains vulnerable to shocks. At the same time, high debt levels open up New Zealand households to financial risk. Banks still need to better manage their conduct risk and lend responsibly, the report says, and RBNZ will continue monitoring their behaviour. “The Reserve Bank and Financial Markets Authority recently reviewed the culture and conduct of New Zealand’s banking system. Here we are into December already, and the uncertainty over Brexit remains, dragging Sterling down further against the New Zealand Dollar. The good news is that the European Union has finally agreed a Brexit deal. The 585-page withdrawal agreement covers citizens rights, the ‘divorce’ payment and the a ‘backstop’ for the Irish border, which seeks to retain an open border on Ireland in the event of a no-deal Brexit. The bad news is that the arrangements are deeply unpopular with MPs, who are voting on the measure on Tuesday 11 December. When the terms of the agreement, were first made public, there was a handful of resignations by Government ministers and claims that disgruntled Conservative MPs would bring about a vote of no confidence in Mrs May by sending 48 letters to the backbench body, the 1922 committee. But at time of writing, the rebels remain short of their target and Theresa May clings on to power. Ahead of the Parliamentary vote, she is touring the country, desperately trying to drum up support for her deal in the face of doubt that enough MPs will support it. If the deal fails, it is anybody’s guess what happens next. Mrs May could amend the agreement and with the support of the EU and the cabinet, bring back a revised deal to parliament. On the other hand, Britain could leave the European Union on 29 March 2019 with no agreement. A disorderly Brexit could see a huge 8% decline in the UK economy, warns Bank of England Governor, Mark Carney, along with a 25% fall in the value of the Pound and a decline in house prices of almost one-third. If more unhappy MPs write to the 1922 committee, Theresa May could face that no-confidence vote and a leadership contest, or she could resign and call a general election. It is little wonder that in the face of all that confusion, the Pound has lost value against the New Zealand Dollar. 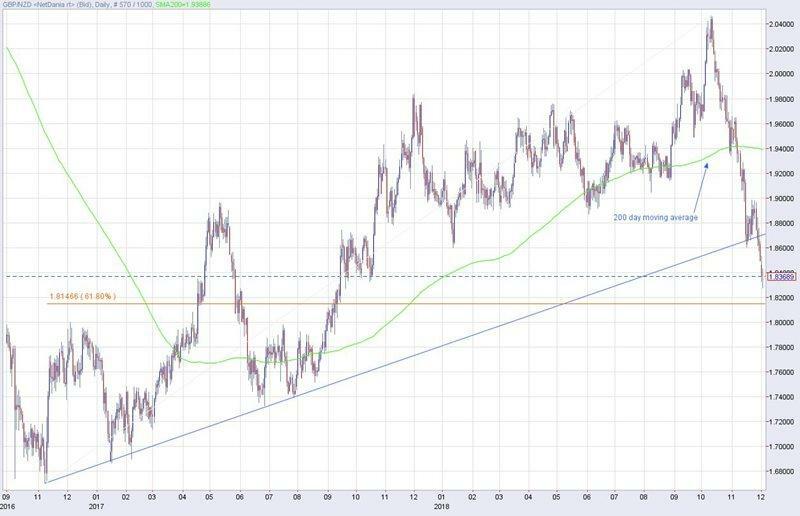 There has been a massive 20-cent drop in GBPNZD from 2.05 the highs we saw in October 2018 – which fell back to October 2017 lows at 1.8250. Looking at the topside, we could see a recovery to around 1.8600 initially, then 1.90-92. So NZD buyers should target below that rate in the short term.